Soleil des Tsingy first opened in 2013, and is a high quality hotel perfectly placed for exploring the 'stone forest' of Tsingy de Bemaraha National Park. It's a well designed property with lots of indoor and outdoor space, making the most of the fine views. The restaurant is a large, high-ceilingd room leading out to a terrace. Meals are prepared by the chef and his team, using produce from the hotel's organic garden. Outside there's an inviting rim-flow swimming pool, and an expansive deck equipped with sunbeds. The adjacent bar serves a range of tempting refreshments. This is a great place to sit and watch the sunset. 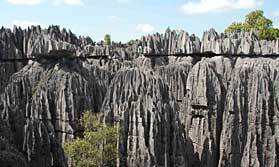 As well as guided walking tours in Tsingy de Bemaraha with its unique kasrt landscape, canyons, forests and lakes, you can visit the small Tsingy, take a ride in a dugout canoe along the Manambolo River to view the dramatic gorges and caves. Nearer at hand the hotel has 20 hectares of private grounds where you can follow walking trails through the forest. Staff at reception are happy to offer advice on excursions, and picnic lunches can be arranged if you're going to be out all day. You stay in a spacious bungalow, with a bedroom that opens on to a wide private terrace. The bedroom has a sofa, a desk and solar-powered electric lighting. The bathroom has a walk-in shower and a hand basin and has full running water, and there's a separate toilet. Open: Le Soleil des Tsingy is open from 1st May till 15th November each year, the dry season. Rains in the wet season often make local roads impassable. The hotel first opened in July 2013. Location: Le Soleil des Tsingy is near the Manalambo River in the Tsingy of Bemaraha, western Madagascar. Rooms: There are 17 guest bungalows, each providing a roomy 55 square of space and a private terrace. Beds are fitted with mosquito nets, there’s a sofa bed, a desk, safe, electric lighting and a fan. Each bathroom has a modern shower and basin and plenty of room for toiletries, and a separate toilet. Activities: You can go on guided visits to Tsingy de Bemaraha National Park with its stunning scenery and varied wildlife, excursions to the small Tsingy, dugout canoe rides on the Manambolo River and a trip to Avenue of the Baobabs. Staff at reception can arrange tour for you. Take a walk along the trail in the Soleil des Tsingy’s private park which covers about 20 hectares. Dining: Breakfast is an ample buffet, and there’s a choice of dishes for lunch and dinner. There’s also a snack bar. Meals are served at separate tables. Much if the produce used is grown in the hotel’s organic kitchen garden. Children: Children of all ages are welcome. Each bungalow has a sofa bed that can sleep one child. "A step up in terms of quality from all previous"